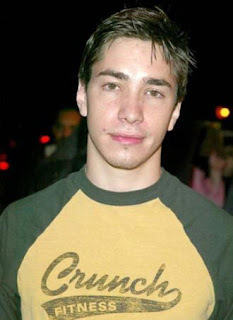 Observe: the dapper Justin Long. You probably know him from those Mac ads or that last Bruce Willis movie, Die Hardest: Diamond in the Rough, or whatever it was. 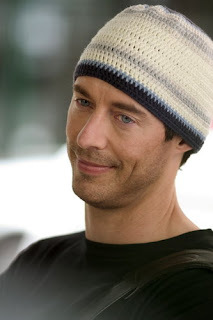 For me, however, the love affair began long before he was age appropriate, when he played Warren Cheswick on a show called Ed starring that delicious Canadian delicacy, Tom Cavanagh. Mrs. G just recycled an old post calling darling Warren's, I mean Justin's, worthiness into question and using him as the "what not to wear" portion of a dating lesson for her daughter. While I would not presume to question her parenting I must take up for my secret boyfriend Warre..I mean, Justin. He's a good guy, the best kind of guy, the kind of guy who would cook you breakfast in his longjohns outside of a tent on the side of a mountain the morning after he didn't wind up losing his virginity. And there ain't nothing sexier than that. He's delicious. I've always had a crush on him. . . yep, since Ed. The mac commercials are good and you'd be surprised at how awesome that last Die Hard was. Old School good. you should check it out. your boyfriend is hysterical in it! He appeals to my Cougar side or front depending on which way I am facing. Good sense of humor, good roles.